Take off from Ayers Rock airport and fly along the northern and western faces of Uluru before you pass along the northern and western faces of Kata Tjuta. You will even have the opportunity to view the elusive eastern face of Kata Tjuta, which is not accessible to the public. 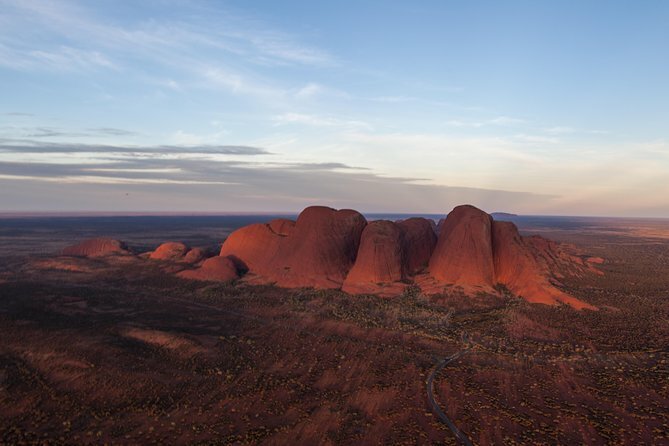 Witness one of the most iconic views of Kata Tjuta, Uluru and Mount Connor lining up to within 1 degree. View the traces left behind from waterfalls running down the sides of Uluru and Kata Tjuta and the marks caused by their formation. Fly over the remains of an ancient coral reef on the way back to Ayers Rock airport with Lake Amadeus in the distance. Your local pilot knows all about Uluru, Kata Tjuta and its surroundings and will provide you with expert commentary, so please feel free to ask as many questions as you like. Experience a view like no other!